The Lion King was my favorite movie as a kid. I’ll admit, I even performed it in the back yard with my brother and sister. So when the stage musical version hit Broadway in 1997 I desperately wanted to see it, but it wasn’t until this week that I got the chance. Not only was it a musical of my favorite Disney movie but it was being directed by my favorite director Julie Taymor, who was the first woman to win a Tony for Best Direction. Brittany couldn’t make it so I had my star back up guest reviewer, Garrett, attend with me. Garrett: Well, I have some great feedback but apparently so do the speakers. G: It was a bit jarring to experience sound and technical difficulties so severe that they had to stop the show, but after I got over that the show was great. K: I’ve never experienced that level of technical difficulties at a professional musical. A first for me for sure. G: I thought the show was incredible though, especially the costumes. What I didn’t love were the filler songs. The songs that were not in the movie that they added to fill out the show. It was fun to see the characters from the movie that I loved so much. 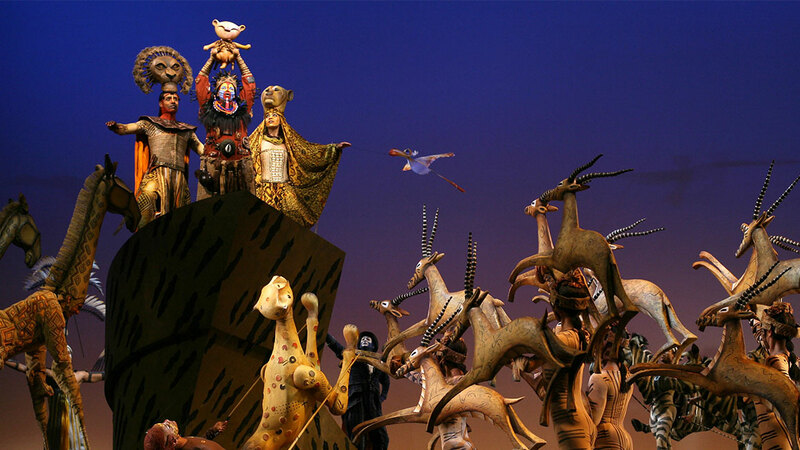 K: This show really had me at the opening number, so many actors in elaborate animal costumes killing the “circle of life”. But there was such a high in the first 30 mins, and then with the disruption of the technical difficulties, I never really got that high back. It was still an amazing piece of theater, but I might have gone in with too high of expectations. The Verdict: While there were some technical difficulties in the production we say, this is still a must-see for anyone who loved the Lion King movie. The nostalgia is so worth it. It’s like watching the movie but better. The Drama Talk: The costumes, set design and the amazing original songs make this show special. It’s no mystery why it won Tony awards for best costumes and set design. However, not every part of this adaptation of the film is award winning. The added filler songs were mediocre and due to sound issues it was sometimes hard to understand who was speaking and what exactly they were saying. Also, the stage version really loses momentum in the second act. Luckily the first act makes the whole show worth it. The Drinks: We headed to our go-to post Orpheum spot with good cocktails Dirty Water. There we had plenty of space to have a drink and take a long walk down The Lion King memory lane. Drama Talk & Drinks: Shocktoberfest 17: Pyramid of Freaks - "Let your freak flag fly"